Rallies are being held at Al Arish/Rafah, in Cairo and in Edinburgh. The cry is 'Set These People Free'. Our friend Khalil Al Niss remains at Rafah. This is the fifteenth day that he stands for justice and for the rational. We have given him material and moral support because he is doing a simple, courageous and good thing. He and Linda have been determined to take 1.5 tons of material into Gaza. This 'material', these goods, are not missiles or M16s but medical supplies. Included are disposable plastic tracheostomy tubes for adults and children who are being kept alive on ventilators. At present the nurses have to reuse the tubes after they are washed in antiseptic solutions, thus risking respiratory infections. Linda Willis has had to return home to her nursing post. The flight from Sharm El Sheikh added to the couple's unforeseen expenses. The D&D has helped with that and in other ways, as it should with this human mission. Linda is attending the Edinburgh rally this afternoon. She will speak in support of Khalil and of his determination to take these gifts directly to the hospitals in Gaza. She might tell of the sick who are waiting in limbo at the Rafah gate. 8000 miles away from the poverty of Gaza and in Beijing, 100 million dollars have been spent on the welcoming ceremony. Jets fly in from all around the world. To enter, all that is needed is a passport and a wallet with yuan or dollar. A national leader pleads for greater human rights in China whilst ignoring the human rights of the Palestinian people completely and many others too. No jets to fly the Gazans anywhere, and besides the airstrip was destroyed in 2002. Instead they scratch around for fuel to run the ambulances and see 'the Games' as a distant image on TV when the power is on. The gates are shut against these lepers all about. The Free Gaza voyage is set to get under way. The Liberty (named after USS Liberty) and the 22 metre yacht, the Free Gaza, are on passage to Crete where there will be a press conference which will include Prof Jeff Halper (Israeli), Ms Lauren Booth (UK) and Ms Huwaida Arraf (Palestinian/US). They will join the boats which will then sail and motor to Cyprus. There about 25 others will embark to send the message 'Set the People Free'. Bon voyage Free Gaza and be 'safe at sea'. The Voyage of the Dove and the Dolphin joins you in spirit on the blue-green seas. 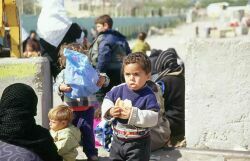 This picture is of some children that Phil Ireland took in Gaza in February 2003. We had gone there on MV Barbara to cry for the child of Palestine then and to shout against the impending genocide of the war on Iraq which was to start six weeks later. One third of these many children in Gaza are deficient in iron, as are their mothers when they give birth. There are several reasons for this anaemia but the main one is the lack of iron in the food. It is well recognised that iron deficiency in the infant retards brain development. Think on that! It is a question of food and freedom, or fireworks. How shameful. How disgusting - 60 + years from the Nuremberg Principles and the Fourth Geneva Convention which forbids collective punishment by one state or in this case by forty. Let them breathe. Let them move, and work and study. 'Set these People Free'.